REECE, MI–P&C Ag Solutions has partnered with AgriSync to further the company’s commitment to providing excellent service and support to area farmers. Through the AgriSync service management tool, P&C Ag Solutions’ expert advisors can deliver additional support and problem solving remotely through any smartphone. This provides another method to help their farmer customers solve problems, make decisions and maximize uptime. P&C Ag Solutions was founded in 2000 with the goal of providing a high-level of expertise in agronomy and technology. They have also become experts in the emerging area of precision agriculture technology, specifically precision planting, providing farmers the latest technology and advancements on the market. AgriSync is the first remote support app for agriculture. It enables live video calling, which will assist techniciansand subject matter experts in providing better service to their farmer customers when breakdowns occur or decisions need to be made. The live video technology allows the advisor to see exactly what the farmer sees to help bring speed to resolution. Within the app, advisors can organize and managetheir helprequests through a ticketing system and obtain instant feedback from customers about the quality of service they received. 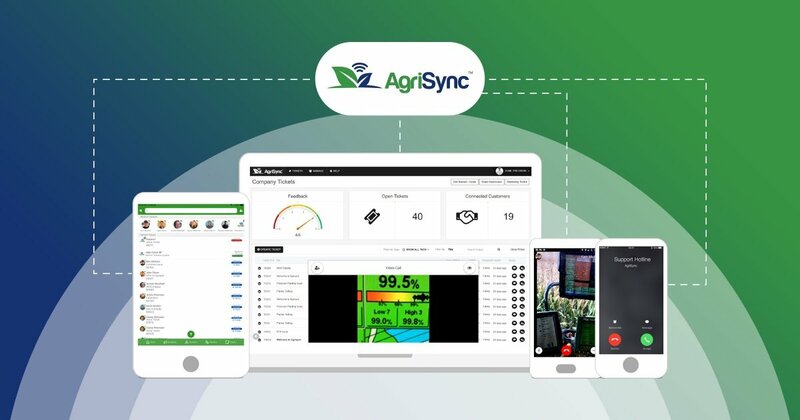 P&C Ag Solutions has introduced AgriSync to current customers and is utilizing this new technology within their service plans and service calls. AgriSync is a privately held company founded in 2014 with the mission to help farmers and the people they rely on connect more efficientlyto make farming less complicated and more productive. The AgriSync service maximizes the use of technology for farmers and lowers the cost of quality service delivery for advisors. For more information, visit www.agrisync.com. P&C Ag Solutions was founded in 2000 with the mission to provide agronomy and technology support to growers to help make decisions on new and emerging precision-ag technologies. P&C Ag Solutions sells and services all brands of precision ag equipment, including Ag Leader, Precision Planting, Soil Max, 360 Yield Center, OPI,AgEagle, andAg Leader SMS software. They are a certified Blue Delta Ag Leader Dealer and Precision Planting Premier Dealer. For more information, visit www.pcagsolutions.com.